One of the nicest things about a Seabourn cruise is that its luxuries don't require one to dress super elegantly to enjoy them. During a weeklong sailing, only one formal night is assigned, and even then, men are not required to wear ties. The rest of the time, "resort casual" is the way to go in the evenings, with comfortable shorts perfectly acceptable onboard during the day. Molton Brown is Seabourn’s toiletry purveyor of choice, but suite attendants present a number of other soaps that are freely available at the beginning of the cruise. So, why not try several? As luxurious as the Molton Brown varieties are, L'Occitane is another fine selection for those who prefer a refreshing lemon scent, for example. Another great joy of the all-suite Encore is its accommodations’ separate living areas with dining tables that are perfect for room service. A standard menu is available 24 hours a day, offering tasty comfort foods, but guests can also order from The Restaurant main dining room during dinner hours for even more gourmet dishes. There’s even a freezer section within the minibar refrigerator that can keep ice cream desserts cold while you enjoy your first courses. All dining on Seabourn is entirely free of charge, but The Grill by Thomas Keller does require reservations in advance. Thankfully, the Encore features greater capacity at this exquisite restaurant. However, the sooner you place a booking the better to ensure you can place your preferred time. Chances are only one dinner can be secured per week, but it can never hurt to waitlist for a second. Besides The Grill by Thomas Keller being enlarged with a greater capacity since the previous Seabourn Quest, Sushi is another new restaurant for additional fine dining options at both lunch and dinner. The venue may be small and tucked out of the way, but it’s certainly worth seeking out for both meals on a first-come. first-served basis. Delicious sashimi, rolls and the like are available at night while cooked bento boxes are offered midday. If there is but one show to attend on the cruise, be sure it’s “An Evening with Sir Tim Rice.” Like Thomas Keller’s cuisine onboard, the production is a brilliantly balanced performance of several of the acclaimed lyricist’s numbers. Four vocalists backed by an abridged orchestra simply sing the timeless tunes following a video introduction of each from Rice himself. Mixtape and jukebox aficionados alike will appreciate that The Club spins the music guests prefer. A neat kiosk in the venue includes a digital media player with a large selection of playlists. When live music is not playing on stage, passengers get to make their own selections that are then added into the room’s ambient rotation. It’s truly a fun feature. 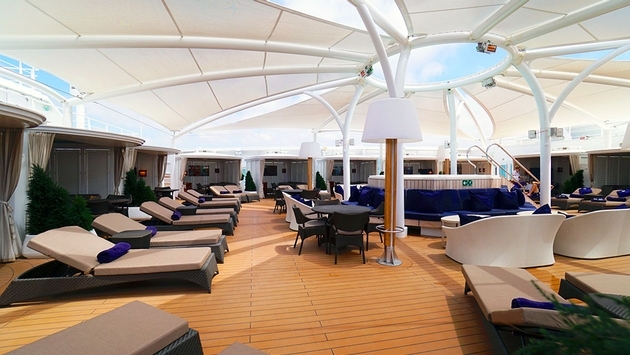 For an even more exclusive experience, The Retreat provides guests (willing to pay an additional surcharge) one of 15 private cabanas on the very top deck of the ship under shade. Each features its own flat-panel television and stocked refrigerator, plush furnishings and loungers, bar and spa menu offerings and Retreat Concierge service. There’s also a welcome central whirlpool to take a dip in as well as a spa services cabana for massages.